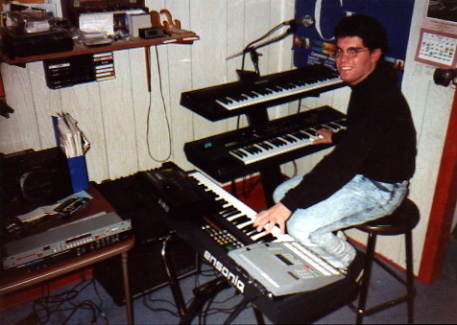 When I was a teenager in the late 1980s and still had dreams of becoming a professional songwriter/musician, I wrote and recorded a song I called “Time Takes Over” in October 1988. It was probably the first complete song (with words and music) I ever wrote. The subject matter was based on sentiments expressed by a former co-worker of mine who was describing how he visited a girl at college after having a summer fling with her. He thought it was more than that, but she didn’t see it that way. Anyway, that was the basis of the lyrics, which—for the first time in my musical life—flowed out practically simultaneously with the music. The original 1988 version below, written when I was 17, does not include the vocals, but you will hear them later on in this post in other forms. Please note that I transferred this from an old cassette tape so that accounts for the audio artifacts. In 1989/1990, I was in an ill-fated techno-rap outfit called TMC+The New Generation and—after a few arrangement tweaks by my friend and then-bandmate Christian Beach—we performed “Time Takes Over” during a very poorly structured live show at the ol’ Green Parrot Rock Club in Neptune, N.J., which you can see below. Finally, a few years ago, I recorded an updated version in GarageBand on my MacBook that includes vocals. In 2012, I re-recorded the vocals and made some additional tweaks. That is the version you can hear below. Enjoy. I’ve gone ahead and updated another song from my old band days in the late 1980s/early 1990s. But this is a bit different because I didn’t write the music for “How I Want to Embrace You”…that was composed by my longtime friend/former bandmate/singer-songwriter Christian Beach. I only wrote the lyrics and I seem to recall playing the bass part into the sequencer. Actually, after I had written the words, Christian had a lyrical idea for the first chorus so that was swapped out. As usual, we managed to make a very rough cassette recording of the song, but that was about it. And since I never played any of the piano/keyboard parts, I basically had to do my best to reconstruct it all. This is about as close as I’ll get and I don’t really have the time to really go any further with it. A little bit about the song itself…this was written somewhat in the early days of the techno/rap combo Christian and I were in with Asbury Park, NJ-based rapper TMC (Tariq Muhammad). Just prior to meeting Tariq, Christian and I had been working together on some electronic, instrumental music influenced by the so-called “new age” music of the time as well as progressive artists like Peter Gabriel and Kate Bush. Even though we were now working with a rapper, we still tried to work some ballads into our set. This actually wasn’t a good idea when you’re playing New Jersey bars like the greatly missed Green Parrot in Neptune, but we did it anyway because we were teenagers who didn’t know any better. It got even worse when we started adding elements of industrial music to our set…while still also performing ballads. That was just weird. Anyway, I never really asked Christian about it, but I always thought of this as a pop song infused with some ideas he had from our new age/progressive days…and I always liked that about this song. I also liked the idea for the harmonies we had back then and did my best to replicate those. I’m not the strongest vocalist in the world, but I do what I can. As an amateur songwriter*, I’ve always wanted to write a Christmas song. And since Christmas songs are usually filled with clichés and my songs seem to always have their fair share of them, I probably should have been able to write one prior to last year. Anyway, “It’s Christmas Time Again” was originally written and recorded on my MacBook (with GarageBand) in late 2011. I posted it to Facebook, where it received some positive comments. I recently updated it a bit and uploaded it to Soundcloud. And, yes, it is obviously influenced by Christmas songs from the late 1970s and 1980s, including a nod to “Do They Know It’s Christmas?” with the closing segment. But I’m a huge Midge Ure fan and never feel he gets enough credit for his role as the primary writer of that song, so that’s my tip of the hat to Midge.